Hume Inspired Kant's Critique of Pure Reason - Fact or Myth? In order to understand Kant’s Critique of Pure Reason (1781) and Hume’s empirical philosophy (as presented in An Enquiry Concerning Human Understanding 1748 and other works), you’ll need to know a bunch of terms. See our pages on understanding Hume’s fork for details, or see the summary below for a quick overview. Hume’s fork is named by later academics due to the idea that we can place Hume’s ideas, as dissected by Kant, into two big groups (“two prongs of a fork”), those based on experience and those based on ideas. Rational (facts based on ideas), Relations of Ideas – Statements about ideas. These are analytic, necessary statements that are knowable a priori. They are known through reason (rationalism). Things we know through thought alone. Ex. “1+2=3”, “all bachelors are unmarried”. Empirical (facts based on experience), Relations of Facts – Statements about the world. These are synthetic, contingent, and knowable a posteriori. They are gained through empirical evidence (empiricism). Things we know through the senses. Ex. “An apple tastes sweet”, “the bachelor is sitting in a chair”. In simple terms Hume’s theory says the two prongs can never touch, and that facts about ideas tell us little about the world, Kant says we can create a synthetic a priori and cross forks (see an explanation of a synthetic a priori). TIP: Kant’s critique of pure reason is mostly a critique of his own style using the theories of Hume, rather than a critique of Hume. Hume died in 1776 before Kant published his work. TIP: Kant was already an established philosopher, professor, and semi-celebrity when he began writing. He didn’t literally “not leave his house for ten years,” but he did spend most of his time in his home writing, thinking, and avoiding social engagements while focusing on his Critique of Pure Reason. TIP: Hume specifically embraces reason, he only rejects pure reason as a means to learn about the world and criticizes the liberal philosophers who didn’t ground their theory in reality like his fellow empiricist John Locke. Also, Hume distinguishes between two types of Empirical data in his Essays delicacy of passion and delicacy of taste. Passion is our animal instincts, taste is the passion one feels from art, discourse, and philosophy. This is to say, he critiques reason in a very specific way, as does Kant. What is the Basic Concept Behind Kant’s Critique of Pure Reason? Just as it sounds, a Critique of Pure Reason is a critique of using only pure reason (of only using one side of the fork). Reason is, in this case, meant as a topic exclusively containing thoughts, relations of Ideas, or rationalism. This is opposed to using empirical evidence, which is what we perceive, relations of facts, or empiricism. Kant’s book calls for combining rationalism (reason) and empiricism (empirical evidence), for all philosophies from natural philosophy (science) to metaphysics (extra-scientific philosophy). That is the basic concept. The specifics involve understanding “Hume’s Fork” (a way to describe Kant’s take on Hume’s dualistic empirical philosophy, a term invented later to describe the concept, not a term used by Kant and Hume). Hume suggests that, while statements about ideas are fine and good for proving other statements about ideas, they can’t prove anything about the world with certainty and thus aren’t very useful (as, for example, saying “all bachelors are married” is really just saying the same thing in two different ways, something Hume calls tautology). The only truth about the world we know for sure is that which we know about the world from sensation. One could not cross the tongs of the two-pronged fork. However, Kant showed that ideas could be used to prove facts about the world. In the words of Wikipedia, “Kant reasoned existence of the synthetic a priori. In common language he showed that statements like F=ma can be true, even though we can’t prove it with direct empirical evidence. Thus Kant crossed the tongs of Hume’s Fork and saved Newton’s laws in the process. This is important because, if we just listen to Hume and the empiricists, then Newton’s law of gravity and laws of motion as laid out in Philosophiæ Naturalis Principia Mathematica (“Principia”, the mathematic principles of natural science) wouldn’t have made the cut as something “we knew for sure” or information that told us something about the world. After all, Newton proves the laws of physics with math and ideas rather than experimental science (just like Kant did). Hume’s logic, taken at face value, says that Newton could prove an apple fell on his head, but showing the math behind it didn’t prove anything about the apple or gravity; As ideas alone don’t prove facts about the world. Without going into the tome’s Kant and Hume wrote, we can simply say, both theory and experience tell us about the world. Not only can we cross prongs, but we must to implement the scientific method! When we focus on only either / or we run into problems. As Kant noted, we can bite an apple and be pretty sure we know it is sweet, but neither reason nor empirical evidence alone is not enough to truly know the apple is sweet. Our senses could be tricking us. Not only can we combine reason and empirical evidence, we often must do so to find truth. Kant reformed his previously reason-only based mindset, refuted the empirical-only mindset of others, and fused the styles into what one could consider the basis of modern thinking. At least it was a basis for ongoing philosophical debate, a concept which closely resembles the scientific method. 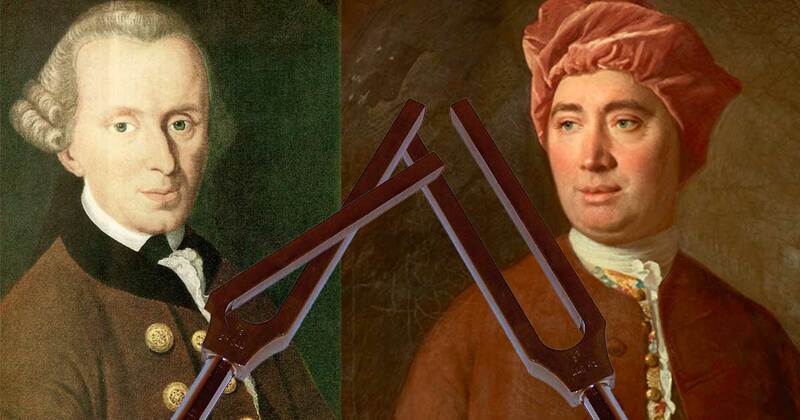 TIP: Neither Kant or Hume ever actually called Hume’s fork “Hume’s fork.” That term was used later to describe the ongoing debate over what we can and can’t know (epistemology). Both, especially Kant, were arguably more concerned with metaphysics more than science and politics, the debate is (through one lens) largely about proving the statement “God Exists”. TIP: Kant never specifically said what Hume works he read (or if he did I’ve missed it), reading Hume I can’t imagine it isn’t An Enquiry Concerning Human Understanding (1748) and his prior work A Treatise of Human Nature (1738-1740). Both of these works weren’t available for Kant in Prussia until later (which is why there is more than a ten year gap between the works). With that in mind, I strongly suggest reading An Enquiry Concerning the Principles of Morals , which Hume himself thought best encapsulated his philosophy (it is mind-blowing, Hume is one of histories better philosophers). TIP: You might note that Kant saved science in ways, but Hume wasn’t totally wrong. In fact, Hume was right in many ways. We actually can’t know facts about the world from ideas with 100% certainly. This is why the scientific method gives us falsifiable theories that can always be replaced with better theories, rather than hard facts. Hume inspired Kant according to Kant himself, and considering they both are some of the most important philosophers of all time, the story is worth more than just a footnote.